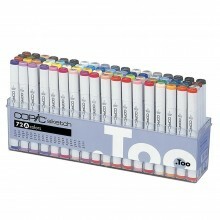 The Copic Sketch Marker is a professional quality twin-tip marker pen for artists, designers and architects. Each pen features a brush tip for fine detailing and lines of varied width, and a chisel tip for bolder work. The ink is alcohol-based and quick-drying.